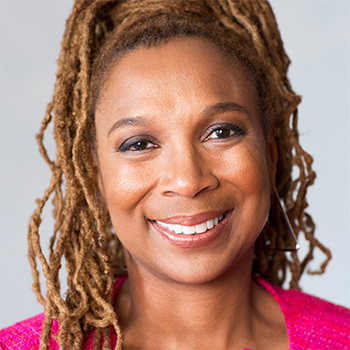 Kimberlé Crenshaw, Professor of Law at UCLA and Columbia Law School, is a leading authority in the area of Civil Rights, Black feminist legal theory, and race, racism and the law. Her articles have appeared in the Harvard Law Review, National Black Law Journal, Stanford Law Review, and Southern California Law Review. She is the founding coordinator of the Critical Race Theory Workshop, and the co-editor of the volume, Critical Race Theory: Key Documents That Shaped the Movement. Crenshaw has lectured widely on race matters, addressing audiences across the country as well as in Europe, India, Africa and South America. Crenshaw has worked extensively on a variety of issues pertaining to gender and race in the domestic arena including violence against women, structural racial inequality, and affirmative action. A specialist on race and gender equality, she has facilitated workshops for human rights activists in Brazil and in India, and for constitutional court judges in South Africa. Her groundbreaking work on “Intersectionality” has traveled globally and was influential in the drafting of the equality clause in the South African Constitution. In 1996, Crenshaw co-founded the African American Policy Forum, a gender and racial justice legal think tank, which houses a variety of projects designed to deliver research-based strategies to better advance social inclusion. In 2011, Crenshaw founded the Center for Intersectionality & Social Policy Studies at Columbia Law School, which aims to foster critical examination of how social structures and related identity categories such as gender, race, and class interact on multiple levels, resulting in social inequality.